This week, we are back with our ongoing series about the native trees of the Chicago area with a look at hickory trees. Hickory trees (Carya sp.) are medium to tall deciduous trees known for their strong, dense wood and edible nuts. Most species of hickory trees can be found in the eastern half of North America, from southern Canada down to northern Mexico, and there are some species found in India, China, and Indochina. Hickory trees have long been sought after for their wood to make a range of items including furniture, flooring, skis, drumsticks, baseball bats, lacrosse sticks, and tool handles. Their edible nuts are also harvested for human consumption. There are between 17 and 19 known species of hickory trees that are divided into typical hickories and pecans. All but five or six of these species can be found throughout the eastern half of North America. Many of the American hickory species are native to the Chicago area. In this guide, we will cover the main characteristics, natural threats, and care tips that are general among all species of hickory and go into further about some of the hickory tree species found in the Chicago area. Hickory trees make an excellent addition to your yard or landscape because they provide shade and their nuts attract wildlife. If you do have a hickory tree on your property, it is important to provide it with the proper care so that it will grow to its full potential. Our professional arborists at Hendricksen Tree Care can provide complete care for your hickory trees in the Chicago area. Our tree care services include tree care and maintenance to prevent issues with insects and disease, tree pruning, and fertilization to prepare them for the growing season. 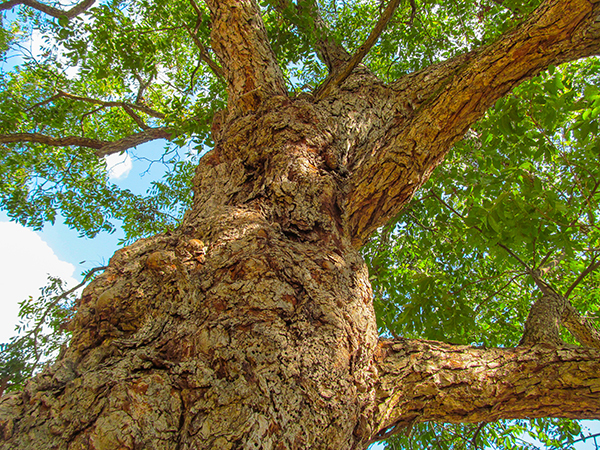 Hickory trees are tall to medium sized trees that range in height from 50 feet to 100 feet depending on the species. Most species of hickory can be identified easily by their gray colored shaggy bark and hickory or pecan nuts. The leaves of a hickory are generally oval shaped, and they may have a lightly serrated edge. Height: Hickory trees vary slightly in height as smaller hickories may be about 50 feet tall and larger hickories can reach heights of 100 feet. They tend to have irregular shaped canopies that can make them between 20 and 50 feet wide. Leaves: The leaves of a hickory tree are typically oval shaped with a serrated edge and they grow in opposite patterns on the branch. Some species of hickory have rounder leaves while others have leaves with a slender shape. The leaves are dark green during the summer and turn to a gold orange color in the fall. Flowers: The flowers of hickory trees are largely inconspicuous as they form small greenish yellow catkins that appear in the spring. Fruit: All hickory trees produce nuts, but the type of nut depends on the species. Typical hickories produce hickory nuts that are in a thick, multi-sectioned husk. 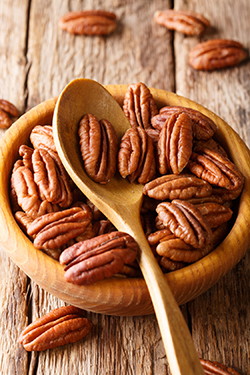 Pecans are produced in thinner, two sectioned husks. While many nuts produce by hickories are edible, some are not. 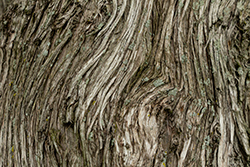 Bark: The bark of most hickory species is gray in color and it is either heavily furrowed or shaggy looking. A pignut hickory has small, uniform furrows while a shagbark hickory has long strips of bark that hang off the trunk. Shagbark hickory specifically has an extract in the bark that is used to make syrup. 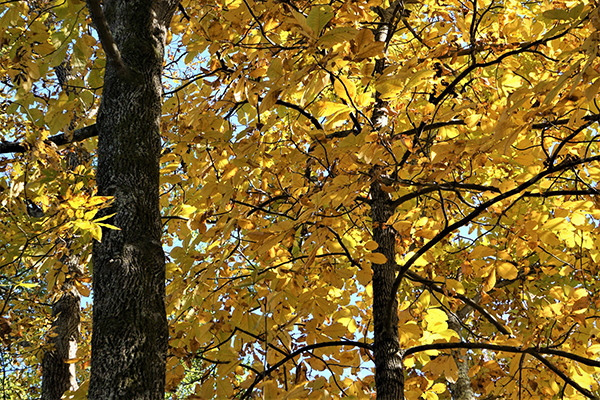 Pignut Hickory: The pignut (Carya glabra) is a tall hickory tree with an irregular crown and tightly furrowed bark. These trees are found in the eastern half of the U.S. and they produce pear shaped nuts with a thin husk that are bitter to the taste. Shellbark Hickory: The shellbark hickory (Carya laciniosa) is found mostly in the Midwest. These trees are named for their plated bark that looks like a shell covering the trunk and they produce large walnuts. Shellbarks are among the tallest hickories and can reach heights of around 100 feet. Red Hickory: The red hickory (Carya ovalis) is very similar to the pignut hickory and is still an unresolved species. Many consider this tree to be a type of pignut. Like the pignut, it has furrowed instead of shaggy bark and produces small nuts in a thin husk. Shagbark Hickory: The shagbark hickory (Carya ovata) is a tall hickory named for its shaggy bark that peels away from the trunk. 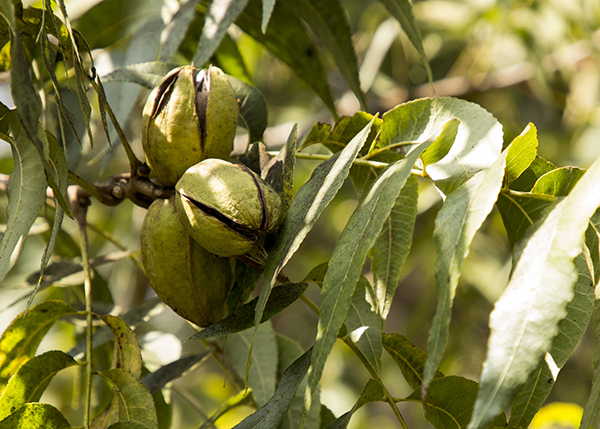 This hickory produces large, round edible nuts in a thick husk. Mockernut Hickory: Mockernut hickories (Carya tomentosa) are small compared to other hickories as they generally reach 50 to 60 feet in height. These hickories have wider leaves than other species and they produce edible hickory nuts in a think, four sectioned husk. Bitternut Hickory: The bitternut hickory (Carya cordiformis) is a large pecan hickory with a shorter lifespan than other hickories. It produces bitter, non-edible pecans in thin shells. Pecan Hickory: The pecan hickory (Carya illinoinensis) is a hickory species that produces edible pecan nuts. 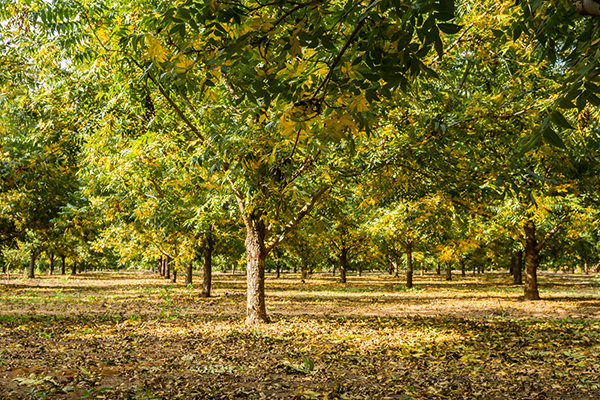 These trees are used for the commercial cultivation of pecans. Anthracnose: Anthracnose is a fungus that causes damage to the leaves of hickory trees, leading to defoliation. Affected leaves have purple colored spots on them that are irregularly shaped. This disease is most likely to occur in wet conditions. Planting your hickory trees far enough apart so they can dry after it rains will help prevent this disease. Leaf Spot: This fungal disease is caused by more than a dozen different types of fungi and it also attacks the leaves of hickory trees. Affected leaves will have spots that appear gray, tan, red, brown, or purple in color. These spots will get bigger over time and eventually lead to defoliation. Leaf spot can generally be treated with a fungicide spray. Trunk Rot: Trunk rot is another fungal disease that attacks the trunk of hickory trees. This disease is most likely to occur if the tree has been damaged by a fire or logging. Most cases of trunk rot cannot be treated, and the tree will need to be removed before it becomes likely to fall. Root Rot: Root rot is a fungal disease that occurs when the soil around the roots does not drain well. This disease will stunt the growth of the tree and eventually lead to the tree’s death. It is important to plant hickories in well-drained soil to avoid this. Canker Rot: The most serious disease that can affect your hickory trees is canker rot. This disease is caused by a fungus that causes cankers around dead branches. The cankers will spread throughout the tree and can even lead to death. You can stop canker rot early with effective pruning. Hickory Bark Beetle: The hickory bark beetle is the most dangerous insect threat to hickory trees. Bark beetles can cause damage to the twigs and small branches and spread fungal diseases that result in cankers. These beetles are small cylindrical shaped bugs that are reddish brown in color, and they lay eggs under the bark of the tree. The larvae hatch within the branches and emerge from them when they mature. The boring from these beetles can weaken the trunk and branches and eventually kill the tree. Pecan Nut Casebearer: The pecan nut casebearer is a moth that overwinters in the larval stage where the bud meets the stem and in the spring, it bores into the young shoots to pupate. When the pecans on the tree are pollinated, the adults lay eggs on the nuts and the larvae feed on the nuts when they hatch. This generation of nut casebearers will also pupate within the nut and emerge in the mid-summer. These insects can wipe out the nut clusters on a hickory tree. Hickory Shuckworm: The hickory shuckworm is another moth that attacks the nuts of a hickory tree. The larvae overwinter in pecan shucks on the ground near the tree and emerge in mid-May to lay eggs on the newly developed pecans. These eggs hatch within the nut and the larvae will feed on the nut until it emerges in late August. These insects will cause the nuts to fall from the tree prematurely. Pecan Weevil: The pecan weevil is a light brown to gray beetle that feeds on hickory tree nuts and lays its eggs on partially matured nuts. The affected nuts will blacken and become shriveled and fall off the tree. The shells will have dark punctures with a dark colored stain around the opening. Planting: It is best to plant new hickory trees in well-drained soil to prevent fungal diseases. Make sure you also plant them in a spot where they will have room to grow to their full height. When planting the tree, the root collar should be right below the ground level. You should remove all weeds within one yard of the new tree. Watering: For new hickory trees, you should water often to keep the soil around the tree moist. After the tree has established itself, you only need to water it during drought conditions. Mulching: Lay mulch around the tree and extend it out to the canopy line to prevent weeds from growing near the trunk. Fertilization: You should fertilize your hickory trees either in the early spring or fall. Use 10-10-10 fertilizer and lay down a pound for each inch of the diameter of the tree trunk five feet above the ground. The fertilizer should be spread in a 3-foot diameter around the tree and watered thoroughly after application. Pruning: Hickory trees should be pruned once per year either in the winter while they are dormant or very early in the spring. Dead and diseased branches must be removed down to the collar without damaging the trunk. If you are unsure about doing this yourself, you should call a professional arborist for tree trimming services. Hickory trees of various species are found all over the Chicago area and they bring shade and wildlife to a landscape. The nuts they produce will attract birds, squirrels, and other wildlife and the shaggy bark adds a unique sense of natural beauty. If you have hickories on your property, you must watch for signs of disease or insect infestations that can harm the tree. If you would like the help of a professional to care for your hickory trees, our arborists at Hendricksen Tree Care can help. Hendricksen Tree Care provides complete tree care services in the northwest Chicago suburbs that include treatment and maintenance, diagnosis of diseases and insect infestations, fertilization, and pruning. 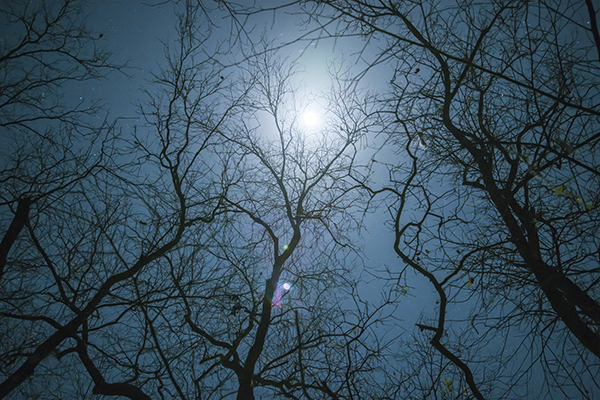 Our ISA certified arborists will understand the needs of your trees and ensure that they get the treatment they need year-round to grow strong and healthy. We can serve residential and commercial tree care clients in the northwest Chicago suburbs including Highland Park, Palatine, Arlington Heights, Mount Prospect, Northbrook, Lake Forest, Libertyville, and the surrounding areas. 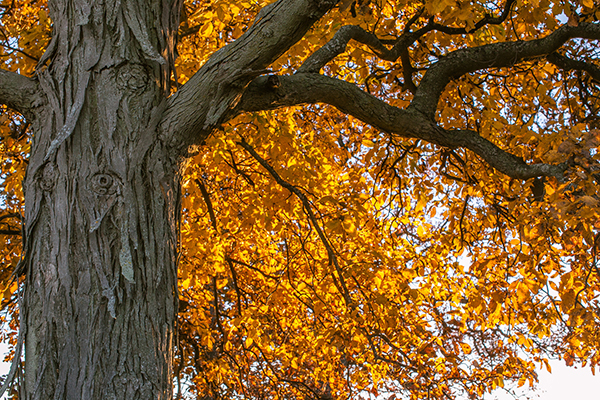 Stay tuned for our next blog in our series about the native trees of Chicago.